"So what are you making for dinner? ": Keep It Simple Sunday! First of all, Happy Father's Day! I baked a Lemon Blueberry Bread this morning and brought it to my Dad's. He said it looked better than what he had bought in the store! For dinner I opted for Keep It Simple Sunday. Last night I made that big salad and we hardly put a dent in it. So I had rotisserie chicken in the freezer. 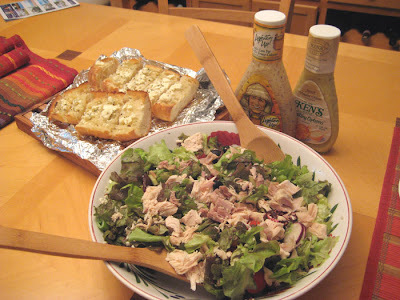 Once defrosted I added it to the salad and voila - Chicken Salad. I had Italian bread that I cut in half and buttered and added feta cheese and orgegano to and put that under the broiler. When it was crispy I removed the bread and spread the cheese. Very tasty. I want to make a big salad.